July 25, 2017 . Leave a comment. Los Angeles, USA— Staples Centre, Tuesday, July 11, Mayweather was happy to soak up a barrage of verbal slander as McGregor set about his dress sense, his fake money status and how he was going to destroy Mayweather’s small core, small head, and small frame. Mayweather hurt McGregor where it hurt most, humiliating the UFC champion for tapping out, not once but three times. The boxing legend also made reference to McGregor’s £3m pay-out for his biggest fight to date, saying that was training camp money for Mayweather. Toronto, Canada — Budweiser Stage, Wednesday, July 12 was all about the fact that during the first press conference McGregor had his mike disconnected during Mayweather’s time on the stage. McGregor made certain that all the boxing fans out there knew that come fight night, McGregor has no issues in chasing down Mayweather and taking the fight to him. Adamant and almost arrogant that still, Mayweather has yet to have a “real fight”. When Mayweather addressed the fans in Toronto he was under a lot of booing and chants from the crowd. His answer was no matter how much they cheered McGregor, they were all powerless come the night to get inside the ring and help McGregor. Floyd Mayweather made light work of McGregor’s taunts and come face off decided to drape an Irish flag across his back to irritate McGregor even more. New York City, USA — Barclays Centre, Thursday, July 13 was more about a polar bear coat and flower pants as Conor McGregor came onto the stage. McGregor gave Mayweather a present, a Jay-Z, 4.44 album, telling Mayweather to learn about building a real empire. McGregor also dismissed any racial accusations that he was a racist, even gyrating on stage offering his actions as a present to all the black girls in the audience. Mayweather took to the stage and again ridiculed McGregor for tapping out three times, laughing and mocking the UFC Champion. Mayweather then showered McGregor in $1 bills saying that was all McGregor was worth. The interesting aspect of this press conference was when Mayweather got his hence men to surround McGregor and his team. The situation was uncomfortable but fortunately, it was all about verbal insults and pushing than anything more sinuous. London, UK — SSE Wembley Arena, Friday, July 14 was the final show down, this time inside a boxing ring. Obviously, this was more comfortable for McGregor as he had by far the majority of the fans on his side. 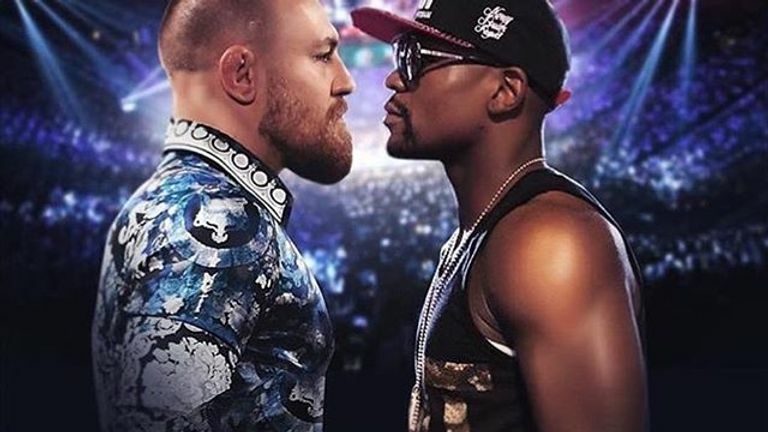 By now it was almost getting a bit boring as both fighters were running through the same script, McGregor insulting Mayweather’s size, his money and the fact he had never had a real fight. Mayweather again taunting McGregor for tapping out, for his small amount of earning in comparison to Mayweather’s. With all four conferences completed, both fighters can now concentrate on their final preparations as both fighters go head to head on August 26th.